You gotta love Twitter. The other day I stumbled across a great article on wedding gift suggestions from Amber Gustafson ofAmber Events in Los Angeles. Amber graciously permitted me to share her article on today’s blog post. If you’re attending a wedding this year and are stumped for a gift, this is for you. Ah, wedding season! The invitations start rolling in, each more beautiful than the one before! You RSVP yes, mark your calendar, and then ask the Maid of Honor where the happy couple is registered. Nordstrom? Of course; the place where the cheapest pair of socks is like $12.99. If the question foremost on your mind this season is how you are going to afford to give nice gifts, then this article is for you. Each gift listed below is under $30.00. Every Bride should have a cloth hankie to use when she walks down the aisle. For $6-12 at an antique store you can find clean, gorgeous, white handkerchiefs with handmade tatting or lace trim. Many times they are monogrammed and you can find one with her initial or the initial of her new last name. Take it a bit further and embroider her wedding date on one corner in either white or pale blue thread. Even if you can’t sew, just Google “embroidery stitch” for step-by-step instructions. If your friend is a classy person, she will be writing a LOT of Thank You notes over the next few months, so either a set of beautiful letterpress Thank You cards or personally designed stationary (more on that below) will come in very handy. Name Change Kit (info adjusted for my Canadian readers). If your friend plans on changing her name, then Easy Name Change Canada will save her an obscene amount of time. This might seem a bit silly, but a lot of brides don’t think to frame their wedding invitation and after the wedding it goes into a box never again to see the light of day. I recommend taking their invitation to a picture frame store and choosing a frame that matches their personal style. Modern couple? Have it floating in a glass block frame. Traditional couple? Choose a luxurious mat and a beautiful dark wood frame. For the couple that celebrates Christmas, a photo frame tree ornament engraved with their wedding date is something that they will love. They will be able to put their favorite wedding photo in it and enjoy it for years to come. Personalization stores such as Things Remembered carry engrave-able ornaments. Choose a bottle of wine that either has some significance in the name of the vineyard, or just a good bottle that you know they will love. Write a letter and include stories of when they were dating, quotes about love, or a meaningful poem. Attach the letter securely to the bottle of wine and write a specific date that they are to open and consume it. Maybe a 5, 10, or 20 year anniversary? As the years go by, the wine becomes more and more valuable to them. As does the letter that is unopened. Anyone with basic publishing software like Microsoft Publisher and some heavy cotton card stock can create personalized stationary for the couple. Are they music lovers? Scan a sheet of music and have it be faded in the background of the card with their initials in the forefront. Make sure you purchase matching envelopes to go with the custom stationary. And make sure they know it is handmade so they know to appreciate it! Whenever I make gifts for friends, I attach these cute little “Made with Love by Amber” cards to them. Granted, this gift is a bit more than $30.00, but I love giving a brass or stainless steel engraved door knocker with their last name and the year their new home was established (i.e., “Jones” on the first line and “Est. 2010″ underneath). A marriage is the creation of a new family and what better way to celebrate than to have it as the first thing people see when they come to your home? Happy gift giving this wedding season! Don’t break the bank! For the last five years, I have offered photo booth services for wedding receptions or parties. Here at Tara Whittaker Photography, we call it Play Station. Add a few props and it’s just like opening up a big can of CRAZY. It’s so much for adults and kids alike. Contact the studio for more information. These are photos from Krista & Jeremy’s play station. See the rest of their wedding here. It’s tradition to have my photo taken with the bride and groom. Excuse my “end-of-the-wedding-crazy-hair”. This past summer I had the pleasure of working with Lynn Fletcher Weddings on a shoot for Luxe by Calgary Bride. 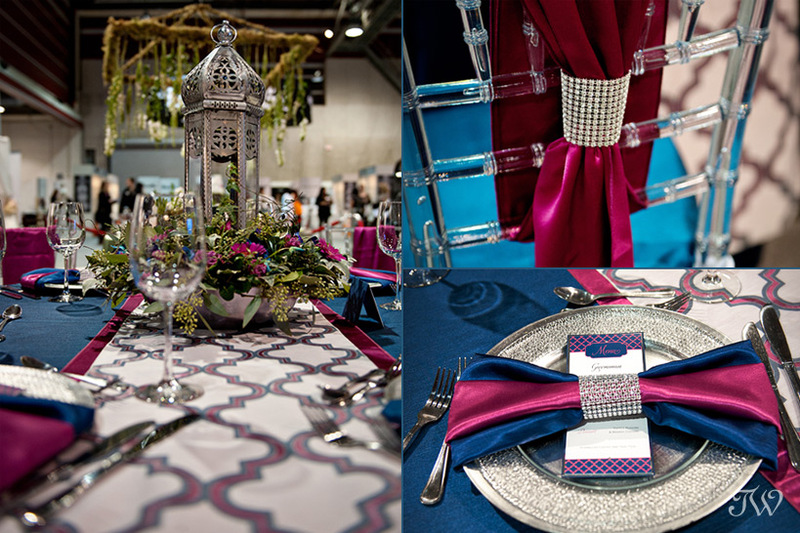 She created two incredible tabletops that day, one incredibly luxurious and one, colourful and rustic. I’ll be sharing those on the blog soon. Knowing what Lynn and her team are capable of, I couldn’t wait to see their displays at Wedding Fair. They did not disappoint. I couldn’t post about Wedding Fair without mentioning my friends at Great Events. Check out their Moroccan-themed entry in the Table Top competition. Love the colour combo. Have your Cakeworks and eat it too! Wedding Fair is usually a bit of a blur but I ducked out of my booth for a few minutes to take some photographs of the brand new Cakeworks booth. It was truly outstanding. Read more about it over on A Spoonful of Vintage. I just can’t say enough good things about ONEWEST Weddings. The talented Mary Swaffield has recently joined the team and I’m so looking forward to what they do together. 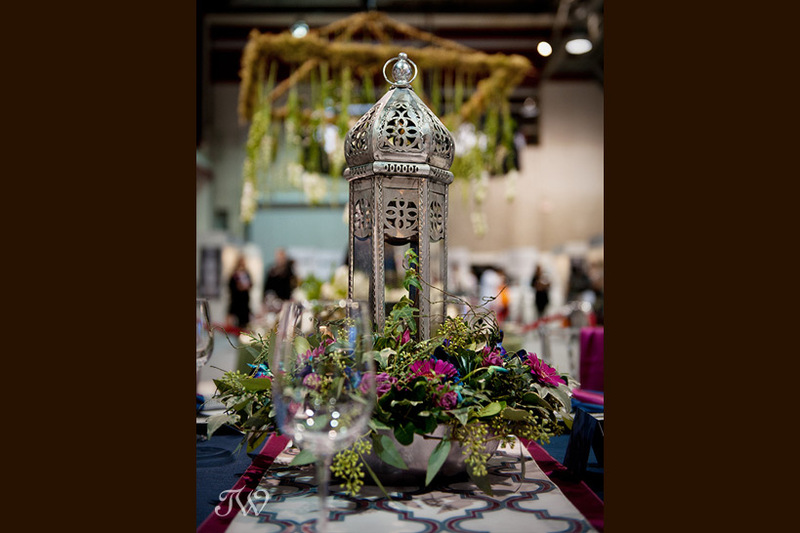 Here’s a few photographs from their design bar at Wedding Fair. Their site is under construction so be sure to check out their Facebook page until it’s up and running again.